This web page is dedicated to African foods. Animals such as cattle, poultry, goats and pigs are all raised for food in Africa. When there is little food and game is scarce, Africans can rely on roots, herbs, and berries for a food source. This is what hunting and gathering societies do. The foods that societies eat depends on what they have access to. Slash and burn agriculture includes cutting down a forest or field, and burning the remains. This creates a compost that fertilizes the ground so they can grow crops. Staple crops, (main foods in society), include corn, millet, rice cassaia, peanuts, and other high starch foods. Other crops include coffee, cocoa and peanuts. Grain produces foods such as flat breads and couscous made of grains of wheat. Couscous, a rice like substance, can be served steamed with spicy foods and vegetables, and possibly pieces of meat if the family can afford it. Farmers can grow crops in parts of the wetter savanna. They can grow grains, beans, cassava, and sweet potatoes. Many of these crops are sold for money (cash crops), such as cotton, peanuts, sugar, bananas, tea, oil palm, tobacco and citrus fruits, and soy beans. These crops are grown during the rainy season because as everyone knows, plants need water to grow. Plants can be grown year round along rivers where there is irrigation. 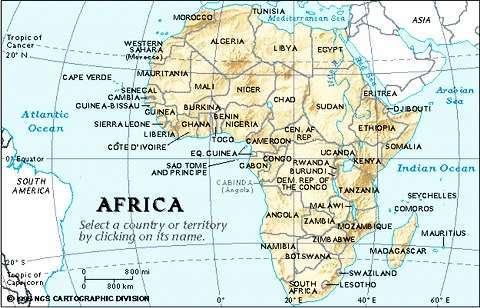 Sixty percent of Africa is farmland and three fourths of Farmers are involved in subsistence farming and agriculture. Subsistence farming is harvesting just enough to feed your family. Fishing is also a popular source of food. Fishing with large nets can bring lots of fish to feed families and to sell for profit. The following are popular African recipes. In a large cooking pot over medium heat warm oil and saute onion, garlic and white stems of chard until wilted, about five minutes. Add chopped greens and continue to saute. Add beans or peas, raisins, yams, tomatoes, salt and pepper. Continue to saute for three to five minutes. Make a well in the center of the mixture and add rice to the well. Pat rice down with a wooden spoon until moist. Cover and cook until rice is complete, about twenty-five minutes. Check mixture occasionally and add water two Tbs. at a time if rice is dry and starting to stick during cooking. Add Tabasco sauce to taste and serve. *In a saucepan boil one cup of water. Add the cabbage to the boiling water. Cover and cook for ten minutes. Heat oil in frying pan, and add the onions and tomatoes. Gently cook until soft. Add the cabbage and salt, and cook for another ten minutes, stirring occasionally. Beat the eggs in a small bowl, and stir into the cabbage and cook for three minutes, until set. Serve with rice, ugali, or potatoes. Serves 4-6. Search the internet with this Lycos search box for more on African foods!